A hearty cousin of lasagna, pastitsio adds unexpected flavors to meat, tomatoes, and pasta. 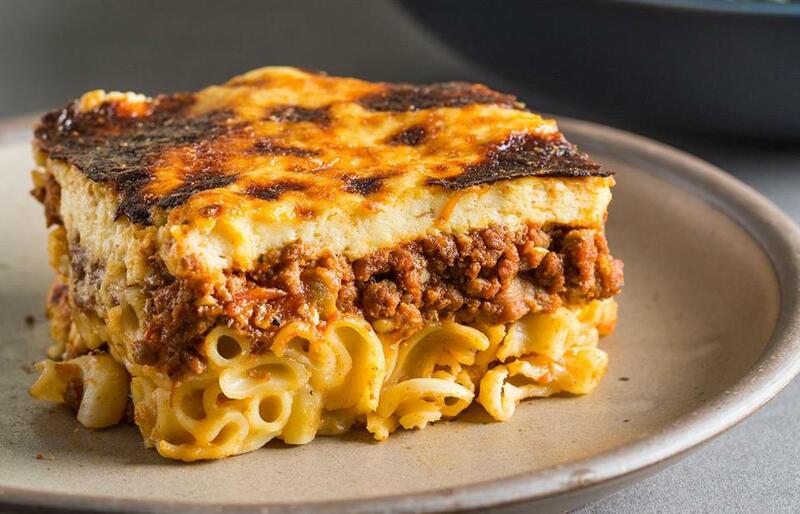 Think of pastitsio, the Greek casserole of tomato-meat sauce, rich béchamel sauce, and pasta, as lasagna’s Aegean cousin, and a similarly sure-fire hit. Developing a pastitsio recipe for Cook’s Country years ago, I learned that red wine boosts the flavor of the tomato-meat sauce, and using beef in it creates a mellower overall dish than with lamb. And a little Greek yogurt enhances the flavor of the béchamel. The dish is filled to the brim when it goes into the oven, so make sure to put it on a baking sheet to catch drips. Make the Béchamel Sauce: Clean and dry the pot, set it over medium heat, and melt the butter. Add the garlic and flour and cook, stirring and scraping the bottom of the pot, until the flour is light golden, about 2 minutes. Whisking constantly, gradually add the milk; adjust the heat to medium-high and bring the mixture to a strong simmer, whisking and scraping the bottom of the pan often. Adjust the heat to medium-low, add the paprika, cayenne, nutmeg, 1½ teaspoons salt, and ½ teaspoon ground black pepper and continue to cook, whisking and scraping, until the sauce is thickened to about the consistency of hollandaise, about 10 minutes longer. Off the heat, add 1½ cups pecorino Romano and whisk to melt and incorporate. (You should have about 5 cups of sauce.) Adjust the seasoning with salt and ground black pepper if necessary. Assemble and bake: With the rack in the middle position, heat the oven to 450 degrees. Line a large rimmed baking sheet with foil. Spray a 13-by-9-inch (3-quart) baking dish with cooking spray and set it on the baking sheet. In a large bowl, mix the macaroni with 1½ cups of the béchamel to combine. Adjust the seasoning with salt and ground black pepper, if necessary, and spread the mixture evenly in the prepared baking dish. Scrape the tomato-meat sauce over the pasta and spread evenly. In the now-empty pasta bowl, beat the eggs. Slowly whisk in 1 cup of remaining béchamel to temper the eggs. 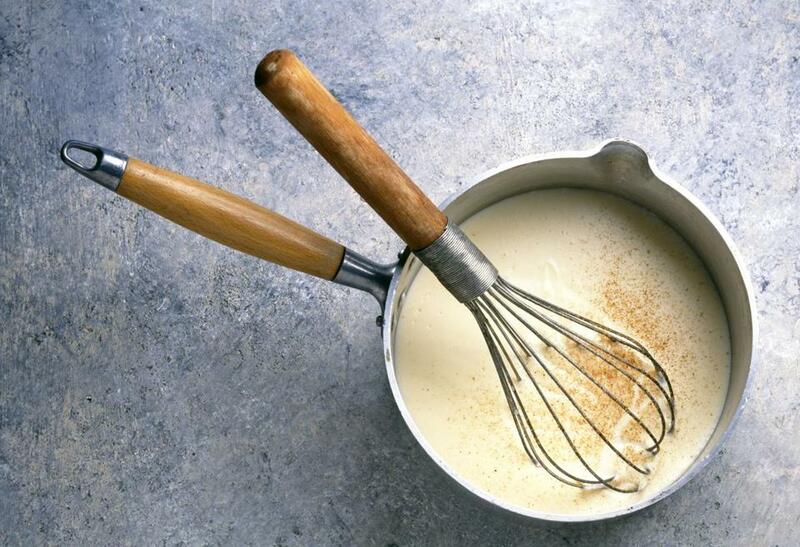 Slowly whisk the tempered egg mixture back into remaining béchamel, add the yogurt, and whisk to combine. (You should have about 5 cups of sauce.) Pour the mixture evenly over the tomato-meat sauce. Sprinkle the surface evenly with the remaining ½ cup pecorino Romano. Bake until the top layer is puffed, spotty golden brown, and bubbly in spots, about 35 to 40 minutes, rotating the dish halfway through. Rest the dish for about 15 minutes and serve. The Pastitsio recipe uses béchamel sauce in two different ways: stirred into the pasta before it goes into the baking dish, and combined with eggs and yogurt to create a firm yet tender top casserole layer. If you can’t find dandelion greens, substitute another type of bitter greens such as broccoli rabe or turnip greens. In a large Dutch oven over medium heat, heat 1½ tablespoons of the oil until shimmering. Add the onion and ½ teaspoon salt and cook, stirring, until softened, about 4 minutes. Add the garlic and cook, stirring, until fragrant, about 40 seconds. Add the dandelion greens and ½ teaspoon salt and cook, stirring, until they wilt, about 2½ minutes longer. Add half the spinach and cook, stirring, until it wilts, about 1 minute longer. Add the remaining spinach and cook, stirring, until all the greens are tender and have released quite a bit of liquid, about 4 minutes longer. With a large slotted spoon or spider, transfer the cooked mixture to a medium bowl, allowing liquid from each scoop to drain back into the pot (reserve the liquid for another use or discard). Add the lemon zest and juice, most of the scallions, ¼ teaspoon salt, and pepper to taste and stir to combine. Add the remaining 1½ tablespoons olive oil and stir to combine. Adjust the seasoning with salt and pepper, if necessary, sprinkle with the remaining scallions, and serve with lemon wedges, drizzling each serving with extra-virgin olive oil. Adam Ried appears regularly on “America’s Test Kitchen.” Send comments to cooking@globe.com.